So I've been kind of quiet for the past week because my 3 year old son needed to have surgery and I was pretty much a giant ball of stress. He's good now and recovering well, kids are more resilient then adults I think so it's back to the blogging!!! 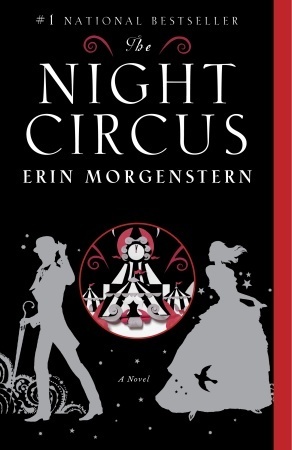 I went to see Erin Morgenstern last night at a book signing at Andersons and it reminded me of how much I absolutely LOVED the book. So I thought I would spotlight it today to remind people to go out and read it if you hadn't. It was just recently released in paperback and I think the cover rivals that of the hard cover. I actually had both my hard cover and paperback books signed, but only the hard cover personalized. Hmm so that means I will probably be giving the paperback away. I want to do something unique for it though since it's a unique book. Perhaps put it together with some other things. So look for that in the future. Also make sure to stop by the blog on Saturday for some Jennifer L. Armentrout cover, trailer revealing. So ignore the fact that in the picture I have no make-up on and look like I haven't slept in weeks. LOL. I really loved this book, it's one of my favorites! I really want to read this book! I've heard so many wonderful things about it.